Miss West Virginia 2013 Miranda Harrison prepares to crown this years Miss West Virginia winner Paige Madden. FAIRMONT, W.Va. — After several months and even years of hard work and dedication, Paige Madden of Moundsville was crowned Miss West Virginia late Tuesday night. Madden represented Miss Southern West Virginia in the Miss West Virginia pageant, which was held at Fairmont State University from June 17-24. By being crowned Miss West Virginia, Madden will go on to represent the state in the Miss America Pageant. 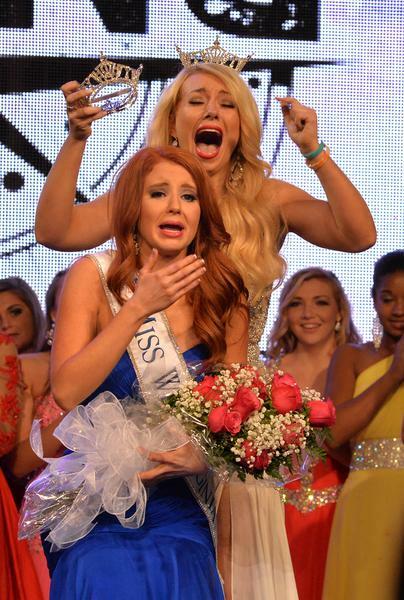 June Braunlich of Wheeling was crowned Miss West Virginia’s Outstanding Teen. She represented Miss Southern West Virginia’s Outstanding Teen. On Tuesday, 40 contestants from all across the state competed in the final round of the Miss West Virginia and Miss West Virginia’s Outstanding Teen Scholarship Pageant. Leah Summers, the executive director of the Miss West Virginia Scholarship Organization, said having the pageant is a way to get young women and teens in the state involved in the community. Summers said all the contestants in both pageants have been putting in hours and hours of volunteer time. “They can earn scholarship money and learn wonderful skills at the same time,” she said.